MarineLog brings us some details of the new Norwegian Icebreaker/Research vessel Kronprins Haakon which has been moved from Fincantieri’s Integrated shipyard of Riva Trigoso and Muggiano, Italy, where the bulk of the construction took place, to Fincantieri Group member Vard’s Langsten shipyard in Norway, where it will be completed. Apparently it is behind schedule. Full technical data is here. It may not look like it, but it has a hangar for two medium size helicopters. Accommodation for 55 persons in 38 cabins (15-17 crew). This looks like something that might evolve into our medium icebreaker. Might also make a pretty good Great Lakes icebreaker. 10,000 KW propulsion makes it about 50% more powerful than the USCGC Mackinaw (WLBB-30). Of course Marinette Marine, which is also a division of Fincantieri, and the yard that built the Mackinaw, would probably be happy to build one or more–and the ship is narrow enough to pass the Saint Lawrence Seaway locks. .
A bit of reshuffling of air assets as SeaWaves reports CGAS Traverse City receives the first of three MH-60Ts that will replace the four MH-65 previously deployed there. One of the H-65s has already been transferred to CGAS Atlantic City. Two will go to the Coast Guard Helicopter Interdiction Tactical Squadron in Jacksonville, Florida. One will be transferred to the Coast Guard Aviation Training Center in Mobile, Alabama, to support a fleet-wide training initiative associated with a modernization effort. Finland Builds an LNG Powered Icebreaker. 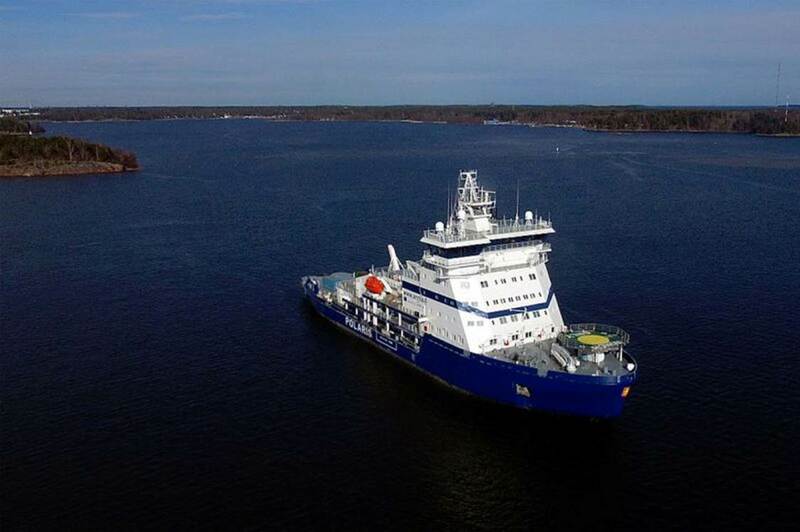 ARCTECH has completed the World’s first LNG powered (dual fuel capable, low sulfur diesel or LNG) icebreaker, NB501 Polaris, for the Finnish Transport Agency, and it is currently in sea trials. The vessel will be able to move continuously through about 1.6 meter thick level ice, to break a 25 meter wide channel in 1.2 meter thick ice at speed of 6 knots, as well as to reach 9…11 knots of average assistance speed in the demanding icebreaking conditions in the Baltic Sea. In open water the service speed will be 16 knots. Its dimensions are 110x24x8 meters or 361x79x26 feet. Its propulsion comes from three azimuthing propulsors totaling 19kW or about 25,500 HP. Specs here (pdf). Crew requirements are tiny at 16.